We have good news, Oak Hill. You too can find relief from the summer sun, right in your own home. 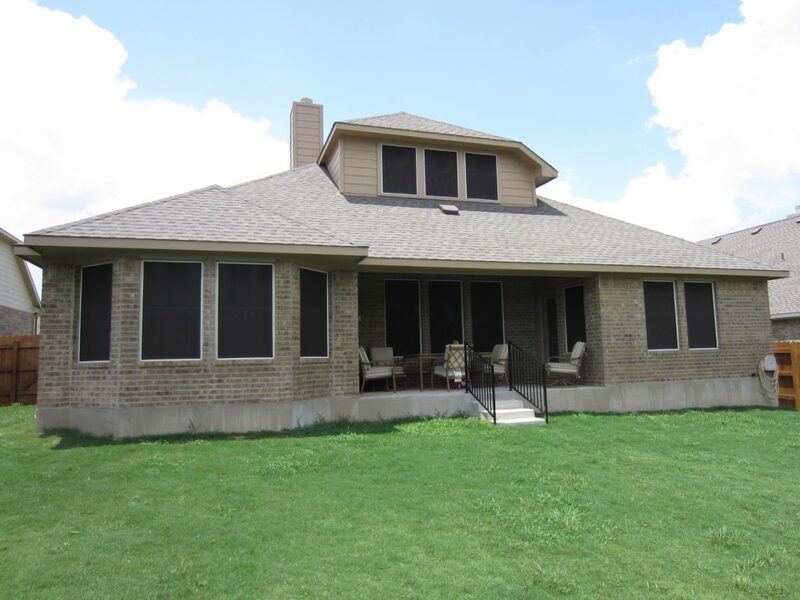 The Austin Shade Team is more than happy to provide our custom solar window shades and solar window screen installation in Oak Hill. We’ll come right to your home, measure your windows, patio space, door, or whatever area you wish to be covered by our solar window shades, give you an estimate, invite you to choose your fabric color and density, and get started on installation. Our solar window shades provide relief by blocking the sun’s heat and potentially harmful UV rays from entering your home, helping not only to provide comfort to you but also to your monthly energy bill. We strive to provide exceptional customer service and high quality products, all of which are manufactured by us in Austin. So give us a call today. We can help. Looking for a solar window shade that you can maneuver up and down? We have exactly what you need, friends in Oak Hill. Our solar window shades come with a stainless steel pull chain so that you can roll them up during the morning to feel the sunlight, and roll them down in the afternoon to keep the house cool and comfortable. Here’s a great picture that shows what our solar window shades for a patio look like. These are two solar window shades that we made for this customer to protect his patio. The solar window shades roll up and down by pull chain. Once they are in the down position, there are tie-downs that allow the solar window shades to be tied down. Tying the solar window shades down keeps them from blowing around in the Wind. It is important that you tie the roll up solar window shades down when it is windy otherwise they will blow around in the wind as the solar window shades are huge shades that are extremely susceptible to movement by the wind. 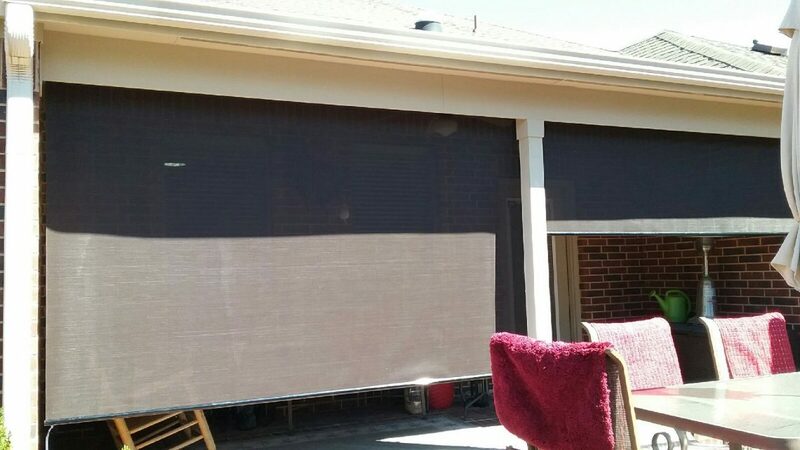 Even better, we can install our roller sun shades on your outdoor patio so you can enjoy your porch, pool, or other space with the proper shade to make it worthwhile. This is a picture showing some 92% interior solar window shades. We build these interior solar window shades for commercial applications. You can install them in your home, but ideally they are made for commercial applications. 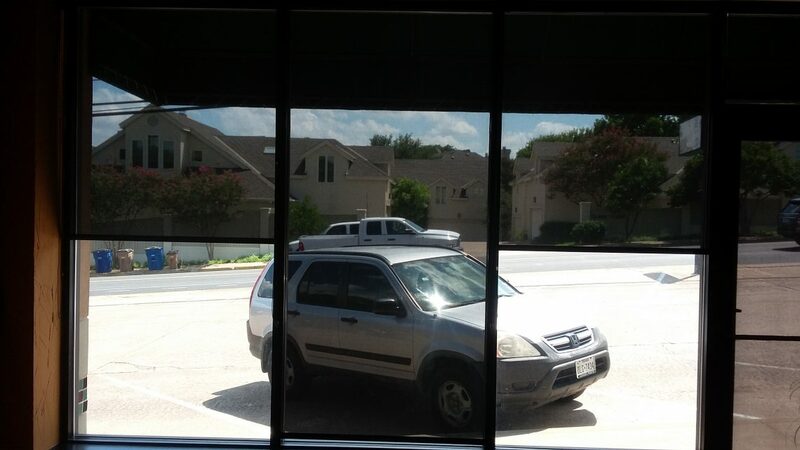 This picture here is a fine example, as this is a commercial property, a commercial storefront, where they wanted these interior roll down solar window shades. We can make our internal solar window shades out of a 92% shade fabric, and a 97% shade fabric. Most people that want the internal solar window shades what the darkest solar shade fabric that we can get for them, which is the 97% shade fabric. Learn more by visiting our solar window shade Q&A page. We are happy to offer our signature solar window screens for no additional installation costs to our friends in Oak Hill. We guarantee you won’t be sorry after calling the Austin Shade Team. 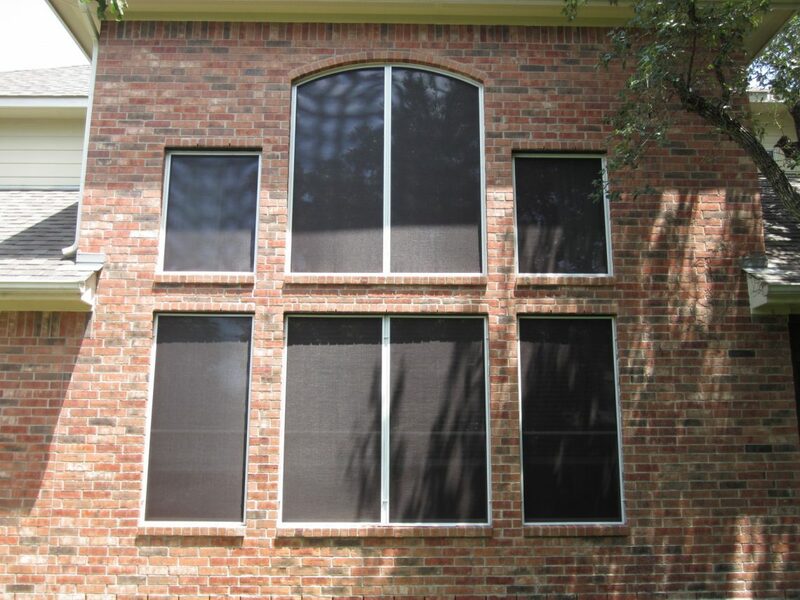 Our solar window screens will be measured and fitted to any shape window, helping to reduce the amount of heat entering your home and providing much needed shade relief during the hot Texas summer. This is a great picture here showing some beautifully made and extremely well installed solar window screens. These Austin TX solar screens were made using our 90% shade fabric screens. You can see those two half arched screens there on the second floor how well they follow the curvature of those two top Arches. We are Masters when it comes to building arched solar screens like this. In addition we can make oval solar screens, half circle solar screens, hexagon solar screens, and trapezoid solar screens. We can match pretty much any shape of window out there with a solar screen. So if you have an odd shaped window, no worries, we can fit a solar screen over that odd shaped window and we will make that solar screen look just like the window. This next picture shows a whole host of 90% solar screens. This customer put solar screens on all of these windows which includes the windows under the back patio. This customer also put solar screens on the back patio door. It looks very nice. The screens look very nice, the back of this home looks very nice. This customer has quite a few windows on the back of their home, which faces West, hence why we used the 90% solar screen fabric. And now with this customer’s home shaded with the 90% solar screens on the back windows, and 80% solar screens on all of the rest of their windows, their home is staying significantly cooler now that it’s being shaded. Learn more about our solar screen pricing by clicking this link or call today for your estimate.